Newsflash: The MSC Seaside and Norwegian Joy tied for first place in the "Best New Ship" category for the 2017 Cruise Hive awards. In second place was the Majestic Princess, and in third place the MSC Meraviglia. With its zip lines, supertubes, rope course and high bridge with a glass bottom; you'll especially love the MSC Seaside if you have a good head for heights. 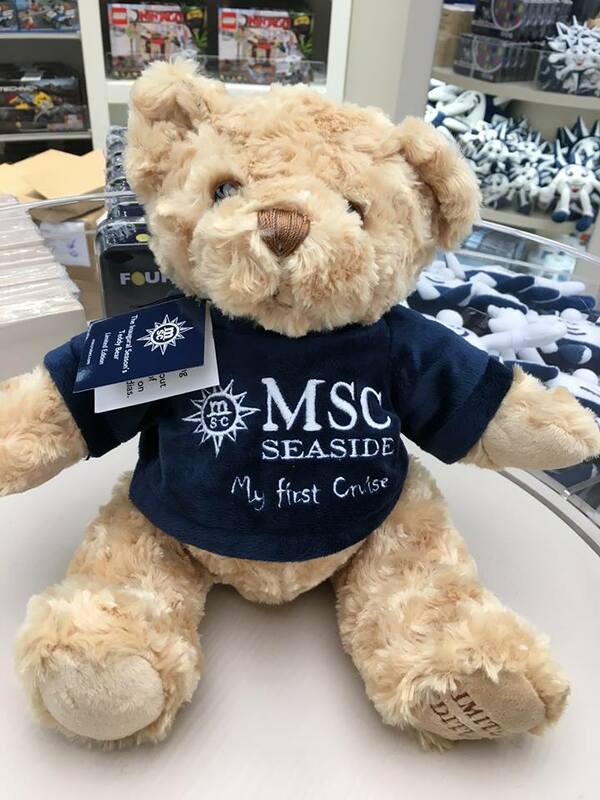 The Seaside is the first MSC ship to be christened in the United States, and is also the first of its new Seaside class of vessels. She set sail on her maiden voyage from Trieste on the 1st December 2017 arriving in Miami on the 21st December 2017. Her first cruise departing from Miami will be a 7 night cruise from Miami left on the 23rd Dec 2017; cruising to Antigua, Saint Thomas (US Virgin Islands) and Nassau (the Bahamas) before heading back to Miami (a Christmas cruise complete with carols, gluhwein, Christmas movies and a tree )lighting. Book your cruise by emailing cruises@southafrica.to. Miami is the Seaside's year-round home port and alernating each weekend between going to the western Caribbean and eastern Caribbean. The second Seaside class ship will be delivered during May 2018 and a third ship might be delivered during 2021. MSC and Port Miami have siqned a letter of intent to construct a dedicated terminal and new berth which will serve as the MSC Seaside's homeport. A 360° waterfront promenade circumnavigates the ship, providing access to bars, restaurants and shops. A glass skywalk provides a view of the ocean from above, with the "Bridge of Sighs" and its glass floor way up above the aft pool on deck 7". Panorama pool on top deck. South beach pool connected to the top deck by two panoramic elevators. A double-deck glass-walled atrium covers two decks, providing a venue for live entertainment with an ocean view. MSC Aurea spa offers Balinese treatments. Thermal area, beauty salon and nail boutique are also part of the spa. There's even a salt and snow room at the spa! The gym is equipped with Technogym cardio and strength training equipment. The ship has been designed with 2 staircases as opposed to the traditional 3, resulting in more space for cabins and public areas. 2023 The second Seaside EV0 Class ship is launched. 2021 The first Seaside EV0 Class ship is launched; larger than existing Seaside class ships. Dec 2017. The MSC Seaside breaks the VSAT maritime record, using EpicNG satellites to get in excess of 500Mbps over Sealink VSAT. Its usual speed is expected to be more in the 100Mbps range. 29 Nov 2017. The delivery ceremony for the Seaside. 30 Nov 2017. The MSC Seaside is launched. 21 Dec 2017. 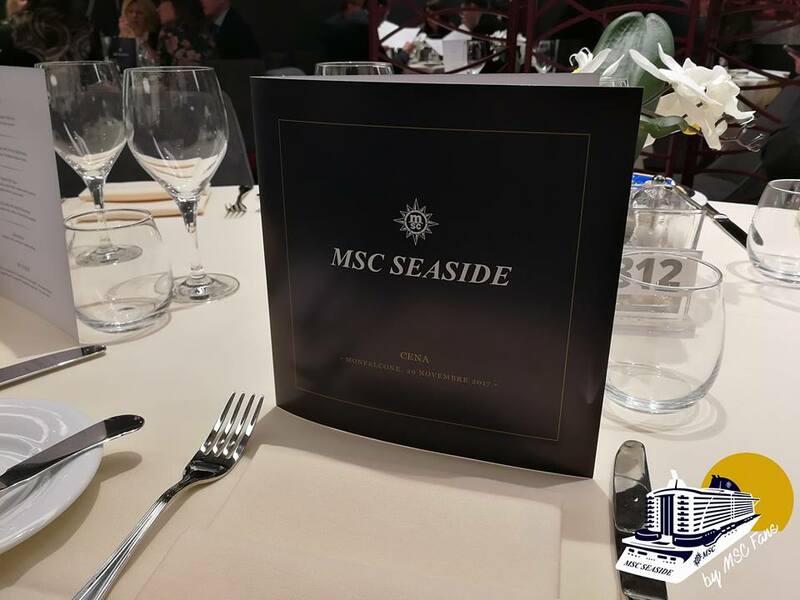 The naming ceremony for the MSC Seaside takes place in Miami. Aquaventure and Adventure park: multi-storey aqua park with five different water slides, including two high-speed slides with clear loops that extend over the side of the ship, and one which involves playing a video game whilst riding on a board which transmits electronic data (slideboarding). Features slide-boarding technology for the first time on a cruise ship, which combines an interactive game, lights, music and a 367 foot water slide. Also has an AquaPlay area for toddlers and and adventure trail. The Seaside will have the largest aqua park on any cruise ship in the world. The Seaside has the longest zip long of any cruise ship - it's longer than Royal Caribbean's, and slower, which gives you more time to look around and feel at one with the environment. There are 2 of them, so you can do it alongside a buddy, and enjoy something that is not a common sight at sea. Here's a video of the ship's captain, Pier Paolo, trying out the zip line - brave man! (and how awesome to have a captain who knows how to have fun). The 934-seater Metropolitan Theatre: offers a variety of spectacular shows. In December 2017, MSC are going to have improvisational comedy shows, hosted by Canada's BeerProv troupe; which involves them doing skits based on audience suggestions. Twice a cruise there shall be movies in the theatre which are suitable for the entire family to watch. News and Comedy Club: offers live comedy acts. Full Sized Bowling Allies: two full sized bowling alleys. Baby Club: gamess and activities for children between 1 and 3 years old. Mini Club (ages 3 to 6) and Juniors Club (ages 7 to 11), in partnership with Lego (there are 2 lego rooms on board - the Lego Pirates room for the Junior Club and the Lego Sailor Room for the Mini Club). Every cruise includes a special event, the Lego Experience On Board, an entire day dedicated to Lego based activities. in the evening from 23h00 to 02h00. Teens Club: two teenager's clubs, one for 12 - 14 year olds and one for 15 - 17 years old. Teens only area serves as cinema, gaming room and disco depending on the time of day. The Doremiland kids area, has the most space out of any MSC Cruises ships. Whether you're looking for anything from lobster to pizza, you'll find it on the ship. The Seaside has a total of 30 bars and restaurants. Pan Asian Market Kitchen: designed in collaboration with award-winning celebrity chef Roy Yamaguchi, creator of Hawaiian fusion cuisine. This will be in his 3 kitchens in 1 style: Sushi + Teppanyaki Grills + Asian Food. Ocean Cay Restaurant: mainly serves seafood. Butcher's Cut: steakhouse, offers wines, beers and cocktails as well. Teppanyaki Restaurant: serves authentic Asian cuisine, also created in collaboration with Roy Yamaguchi. Colonial Buffe and Pizzeria: dedicated family buffet on deck 16.